DVD (a common initialism for Digital Video Disc or Digital Versatile Disc) is an optical disc storage media format that can be used for data storage, including movies with high video and sound quality. DVDs resemble compact discs as their diameter is the same (120 mm (4.72 inches) or occasionally 80 mm (3.15 inches)), but they are encoded in a different format and at a much higher density. All read-only DVD discs, regardless of type, are DVD-ROM discs. This includes replicated (factory pressed), recorded (burned), video, audio, and data DVDs. A DVD with properly formatted and structured video content is a DVD-Video. DVDs with properly formatted and structured audio are DVD-Audio discs. Everything else (including other types of DVD discs with video) is referred to as a DVD-Data disc. Many people, however, use the term "DVD-ROM" to refer to pressed data disks only. 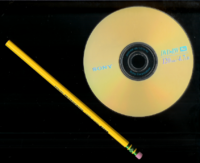 A 12 cm Sony DVD+RW shown in comparison in size to a 7.5 inch Dixon Ticonderoga pencil. 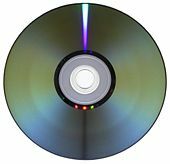 In the early 1990s, two high-density optical storage standards were being developed; one was the MultiMedia Compact Disc, backed by Philips and Sony, and the other was the Super Density disc, supported by Toshiba, Time-Warner, Matsushita Electric, Hitachi, Mitsubishi Electric, Pioneer, Thomson, and JVC. IBM's president, Lou Gerstner, led an effort to unite the two camps behind a single standard, anticipating a repeat of the costly format war between VHS and Betamax in the 1980s. Philips and Sony abandoned their MultiMedia Compact Disc and fully agreed upon Toshiba's SuperDensity Disc with only one modification, namely, Eight-to-Fourteen Modulation (EFMPlus). EFMPlus was chosen as it has great resilience against disc damage such as scratches and fingerprints. EFMPlus, created by Kees Immink, who also designed EFM, is six percent less efficient than the Toshiba's code, which resulted in a capacity of 4.7 GB as opposed to the original 5 GB. The result was the DVD specification, finalized for the DVD movie player and DVD-ROM computer applications in December of 1995. In May 1997, the DVD Consortium was replaced by the DVD Forum, which is open to all other companies. 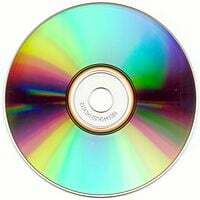 "DVD," originally used as an initialism for "digital videodisk", was decided to officially stand for "digital versatile disc" at the time of the 1995 specification finalization (due to non-video applications). DVD uses 650 nm wavelength laser diode light as opposed to 780 nm for CD. This permits a smaller spot on the media surface that is 1.32 µm for DVD while it was 2.11 µm for CD. Writing speeds for DVD were 1x, that is 1350 kB/s (1318 KiB/s), in first drives and media models. More recent models at 18x or 20x have 18 or 20 times that speed. Note that for CD drives, 1x means 153.6 kB/s (150 KiB/s), 9 times slower. Note: GB here means gigabyte, equal to 109 (or 1,000,000,000) bytes. Many programs will display gibibyte (GiB), equal to 230 (or 1,073,741,824) bytes. Example: A disc with 8.5 GB capacity is equivalent to: (8.5 × 1,000,000,000) / 1,073,741,824 ≈ 7.92 GiB. The four basic types of DVD are referred to by their capacity in gigabytes, rounded up to the nearest integer. Another format in limited use is a double sided DVD with one side comprising a single layer of data while the opposite side comprises two layers of data (effectively a DVD-5 on one side bonded to a DVD-9 on the other). This format holds approximately 12.3 GB of data and is known as DVD-14. Hewlett-Packard (HP) initially developed recordable DVD media from the need to store data for back-up and transport. DVD recordables are now also used for consumer audio and video recording. Three formats were developed: DVD-R/RW (minus/dash), DVD+R/RW (plus), DVD-RAM (random access memory). A Dual Layer disc differs from its usual DVD counterpart by employing a second physical layer within the disc itself. The drive with Dual Layer capability accesses the second layer by shining the laser through the first semi-transparent layer. The layer change mechanism in some DVD players can show a noticeable pause, as long as two seconds by some accounts. More than a few viewers have worried that their dual layer discs were damaged or defective. DVD recordable discs supporting this technology are backward compatible with some existing DVD players and DVD-ROM drives. Many current DVD recorders support dual-layer technology, and the price point is comparable to that of single-layer drives, though the blank media remains significantly more expensive. DVD-Video is a standard for storing video content on DVD media. As of 2003, DVD-Video has become the dominant form of consumer video formats in the United States, Europe, and Australia. Though many resolutions and formats are supported, most consumer DVD-Video disks utilize either 4:3 or 16:9 aspect ratio MPEG-2 video, stored at a resolution of 720×480 (NTSC) or 720×576 (PAL). Audio is commonly stored using the Dolby Digital (AC-3) and/or Digital Theater System (DTS) formats, ranging from monaural to 5.1 channel "Surround Sound" presentations. DVD-Video also supports features like selectable subtitles, multiple camera angles and multiple audio tracks. DVD-Audio is a format for delivering high-fidelity audio content on a DVD. It offers many channel configuration options (from mono to 5.1 surround sound) at various sampling frequencies and sample rates. Compared with the CD format, the much higher capacity DVD format enables the inclusion of either considerably more music (with respect to total running time and quantity of songs) or far higher audio quality (reflected by higher linear sampling rates and higher vertical bit-rates, and/or additional channels for spatial sound reproduction). DVD-Audio discs employ a robust copy prevention mechanism, called Content Protection for Prerecorded Media (CPPM) developed by the 4C group (IBM, Intel, Matsushita, and Toshiba). To date, CPPM has not been "broken" in the sense that DVD-Video's Content Scramble System (CSS) has been broken, but ways to circumvent it have been developed. By modifying commercial DVD(-Audio) playback software to write the decrypted and decoded audio streams to the hard disk, users can, essentially, extract content from DVD-Audio discs much in the same way they can from DVD-Video discs. Modern DVD recorders often support additional formats, including DVD+/-R/RW, CD-R/RW, MP3, WMA, SVCD, JPEG, PNG, SVG, KAR and MPEG-4 (DivX/Xvid). Some also include USB ports or flash memory readers. DVD drives for computers usually come with one of two kinds of Regional Playback Control (RPC), either RPC-1 or RPC-2. This is used to enforce the publisher's restrictions on what regions of the world the DVD can be played (Regional lockout and DVD region codes). Most DVD players (both standalone models and software players) come further encumbered with restrictions forbidding the viewer from skipping (or in some cases fast-forwarding) certain content such as copyright warnings or advertisements. See User operation prohibition. Video game systems with DVD-Video playback functionality are PlayStation 2, PlayStation 3, Xbox, Xbox 360, and Panasonic Q. Nintendo's console, the Wii, does not currently have DVD-Video playback functionality, but it is rumored that a new, DVD-Video capable, revision of the console is forthcoming. There are several possible successors to DVD being developed by different consortiums: Sony/Panasonic's Blu-ray Disc (BD), Toshiba's HD DVD and Maxell's Holographic Versatile Disc (HVD). The first generation of holographic media with 300 GB of storage capacity and a 160 Mbit/s transfer rate was scheduled for release in late 2006 by Maxell and its partner, InPhase. On November 18, 2003, the Chinese news agency Xinhua reported the final standard of the Chinese government-sponsored Enhanced Versatile Disc (EVD), and several patents for it. Shortly thereafter the development of the format was halted by a licensing dispute between Chinese companies and On2 Technologies, but on December 6, 2006, 20 Chinese electronic firms unveiled 54 prototype EVD players and announced their intention for the format to completely replace DVDs in China by 2008. On November 19, 2003, the DVD Forum decided by a vote of eight to six that HD DVD will be its official HDTV successor to DVD. This had no effect on the competing Blu-ray Disc Association's (BDA) determination that its format would succeed DVD, especially since most of the voters belonged to both groups. On April 15, 2004, in a co-op project with TOPPAN Printing Co., the electronics giant Sony Corp. successfully developed the paper disc, a storage medium that is made out of 51% paper and offers up to 25 GB of storage, about five times more than the standard 4.7 GB DVD. The disc can be easily cut with scissors and recycled, offering foolproof data security and an environmentally friendly storage media. In April 2000, Sonic Solutions and Ravisent announced hDVD, an HDTV extension to DVD that presaged the HD formats that debuted six years later. This situation—multiple new formats fighting as the successor to a format approaching purported obsolescence—previously appeared as the "war of the speeds" in the record industry of the 1950s. It is also similar to the VHS/Betamax war in consumer video recorders in the late 1980s. The new generations of optical formats have restricted access through various digital rights management schemes such as AACS and HDCP; it remains to be seen what impact the limitation of fair use rights has on their adoption in the marketplace. ↑ DVD Format Unification (press release), Toshiba December 8, 1995 Retrieved November 4, 2007. ↑ A Battle for Influence Over Insatiable Disks, New York Times 1995-01-11. Retrieved November 4, 2007. ↑ DVD-14., afterdawn.com. Retrieved November 8, 2007. ↑ figure, Andy Marken, 2004. Retrieved February 25, 2008. ↑ Dual Layer Recording burnworld.com. Retrieved November 4, 2007. ↑ Backwards Compatible burnworld.com. Retrieved November 4, 2007. ↑ DVD-Audio's CPPM can be got around with a WinDVD patch, cdfreaks.com 06/07/05. Retrieved November 4, 2007. ↑ DVD Recorder Formats dvdrecorderworld.com. Retrieved November 4, 2007. ↑ Nintendo Q&A: Reggie Fils-Aimes talks future of Wii Buzz , Bro 01/22/2007 Retrieved November 4, 2007. ↑ Sonic Solutions ships New hDVD Format, Retrieved November 4, 2007. Bennett, Hugh. April 2004. Understanding Recordable & Rewritable DVD. Optical Storage Technology Association. Retrieved November 8, 2007. Khurshudov, Andrei. 2001. The essential guide to computer data storage from floppy to DVD. Upper Saddle River, NJ: Prentice Hall PTR. ISBN 0130927392. LaBarge, Ralph. 2001. DVD Authoring & Production. DV Expert Series. Lawrence, KS: CMP Books. ISBN 1578200822. Taylor, Jim. 2001. DVD demystified. New York: McGraw-Hill. ISBN 0071350268. Taylor, Jim. 2004. Everything you ever wanted to know about DVD the official DVD FAQ. New York: McGraw-Hill. ISBN 0071433910. This page was last modified on 18 November 2017, at 22:57.